With Mother’s Day coming up on May 8th in the US, as well as April coming to an end, there are a few tablet sales that our tablet readers might be interested in for the next couple of days. 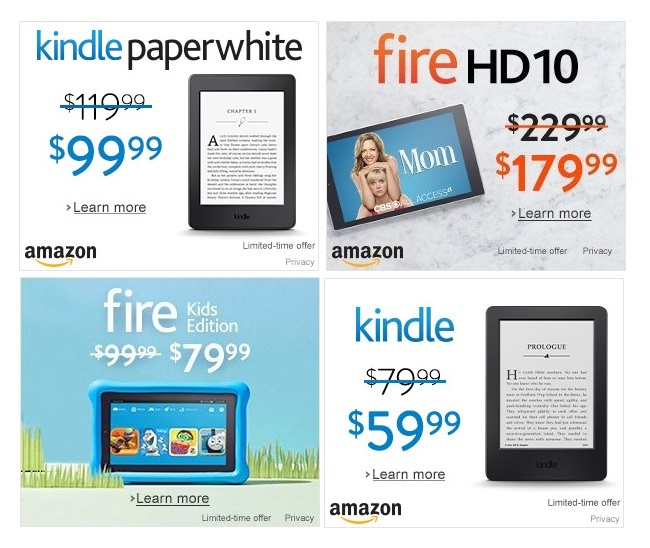 Amazon has 3 Fire tablet deals for Mother’s Day, along with 2 Kindle deals as well. These 5 deals will last through May 6th says Amazon. – Fire HD 10, normally $229, now $179. A 10.1-inch tablet, but it’s a matter of choosing the Fire OS or not. An alternative with higher specs and stock Android OS is the Lenovo Tab 2 A10-70 at the same price. 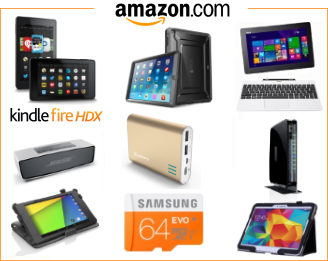 – Fire HD 6, cut from $99 to $69. A bestselling 6-inch Fire OS tablet, with 1280 x 800 resolution. – Fire Kids Edition, not for mom herself then I suppose. But still on sale, with the price down from $99 to $79, with drop case and free replacement. – Kindle Paperwhite, the high specs ereader is given a $20 discount these days too. – Kindle, the cheapest ereader is also on sale, now costing only $59. Some other popular tablets on sale for the next couple of days are these. – Nexus 9. The 8.9-inch Android 6.0 updated tablet made for Google by HTC. With high specs all around, and a decent price cut to $319. – Apple iPad mini 2 with Retina. This is one of the two iPad mini tablets that are currently a part of Apple’s 2016 iPad family, and was updated to iOS 9.3 just a few weeks ago. Always a great tablet, and I can believe I’m saying this, but considering the specs, at $242 now down from $399 this is actually a cheap iPad. There are some Windows 10 devices in very different price categories and bundles on sale these days too. – Vaio Z Canvas. If you really want to splurge, and if someone is really into using tablets for design or drawing, then the former class leading Windows 10 tablet with Intel Core i7 processor, 8GB RAM, and 12.3-inch 2560 x 1704 resolution display is on sale now for $1129. – NuVision TM800W560L. Now on sale for just $99. Ever since we wrote about the launch of this tablet a few months ago, this 8-inch Full HD Windows 10 tablet has caught on, and seems to enjoy good reviews. Since it’s sold from the Microsoft Store, it’s even a Signature Edition. The last Windows 10 sale is a funny bundle from the Microsoft Store, but one that could be lucrative. 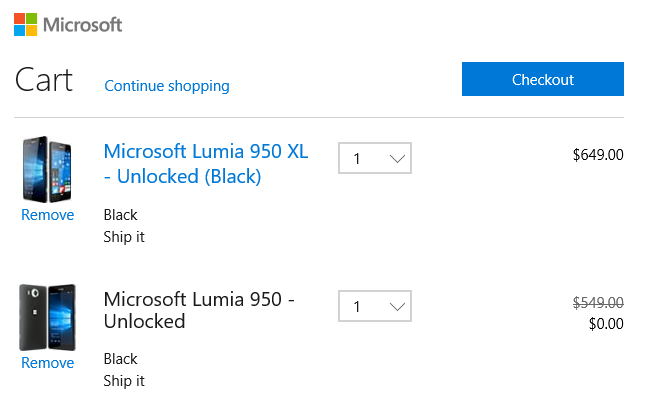 The top-end Windows 10 phone Lumia 950 XL is sold along with a free Lumia 950 for a limited time. The price difference is only $100 for these phones, so if you sell one of the phones afterwards, you can theoretically get one of the the top-end smartphones with 20MP camera, 4K video, 2560×1440 resolution AMOLED display, 3GB RAM, and a snappy Qualcomm processor for $100.